May 2015. It has been about a year. At the time my son Nathan was eight. And he was in tears. "They're all gone, Dad. They all died," he said. The Minecraft village he had so joyfully discovered was now empty, overrun by a zombie siege right before his very eyes. This is a tale of tragedy, triumph, and one very determined little boy. Because today the Lost Village lives again. Shortly after his 8th birthday Nathan started playing Minecraft Pocket Edition for Android (we have an abundance of Android phones and tablets in our household). I joined in so that I could understand what he was interested in and to satisfy my own curiousity about this gaming phenomenon. For those who haven't had first hand experience with Minecraft I won't offer an explanation here, but there are some good, easy to understand explanations available. Discovering that grass could be harvested for seeds, and seeds planted for wheat, and wheat crafted into bread so that we wouldn't starve. Nathan not quite making it back to base one night, and huddling fearfully in the corner of a cave, only to have his brother, in real life 1000 miles away, come blazing through the cave in full armor with an iron sword, clearing mobs and escorting Nathan safely back to base. The excitement of finding pumpkins in the wild, and trying to figure out all the uses to which pumpkins could be put. About this time Alex proposed that we start a new world, which we have been running for a year, and which we affectionately call "Water World". 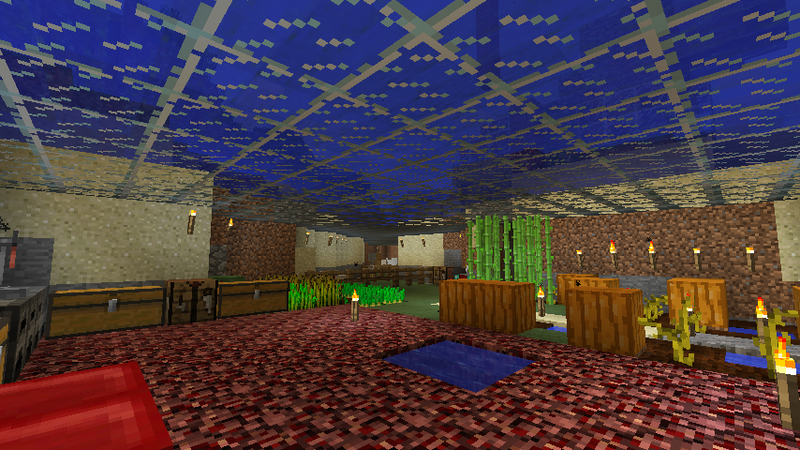 It's an unmodded Minecraft 1.7.9 world in Survival Mode, no cheats or aids of any kind. Alex's idea was that he wanted to build an under water base both because it would be an interesting challenge and because it would offer greater safety, since hostile mobs do not spawn on the water. At times Water World has sat idle, for days or even weeks on end. But we always return to it, and we've made a lot of progress. Let me take you on a tour. 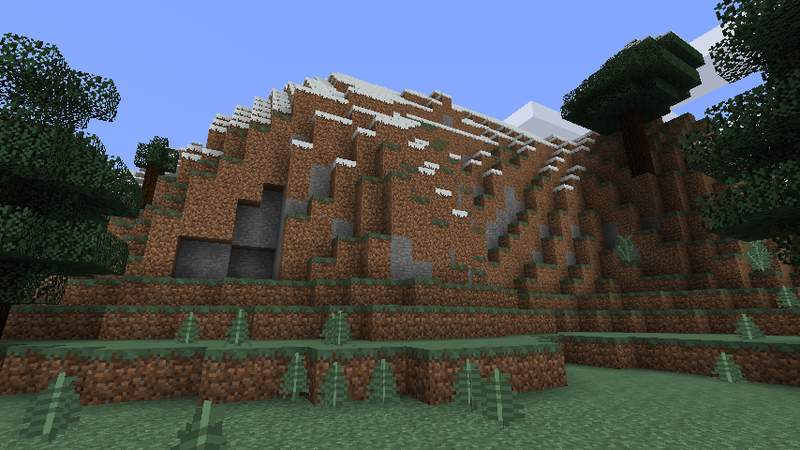 Here's the spawning point - a nice wooded glade surrounded by tall, snowcapped mountains. Not far away the woods give way to a large bay that reaches in from the ocean, with a little inlet off of the bay. This area is now quite built up and fully explored, with mines, farms, and rails connecting all the major points. The real action is below the surface of the water, however. We have a glass ceiling about three blocks down across the entire inlet, and have turned the floor of the inlet into our main base. There's another series of rooms deep down at the bottom of the bay, and glass tunnels to connect it all. One side of the bay is bounded by steep mountains. 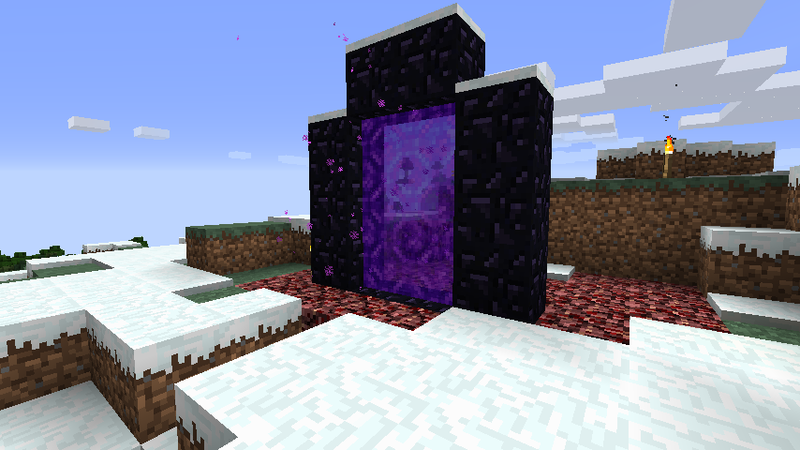 Up in the snow atop the mountains we've built a Nether Portal. We've explored a fair amount of the Nether around the portal, including a Nether Fortress which we have completely looted at this point, leaving only the blaze spawners intact because we still need blazes. Way out in the bay, where it opens out into the ocean, about fifteen blocks below the surface of the water, we found the stronghold containing the End Portal. We have a few more Eyes of Ender to place before we can open up the End, but we're getting close. That's all now. But a year ago it was a different story. We knew so little about Minecraft then, and every session led to new obstacles and new discoveries as we blundered our way through Water World. And that's when it happened. 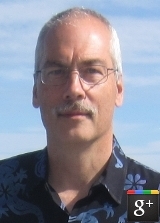 Across the bay from the mountains is a desert, and beyond the desert is a savannah biome. There, at the edge of the savannah, Nathan found a village. He was so excited, with the enthusiasm that only an eight year old boy can have who has unlocked a new adventure. He loved visiting the village, and just hanging out there as the villagers bustled about. There was only one problem. Neither one of us understood what happens in a village at night. Mostly we played together, and mostly I coaxed him back to our main base, and our beds, so that we could pass the night safely. Then one session he was playing alone, and he went to the village, and he didn't come back to base at night. That's when the zombies came. Nathan fought fiercely on his own through the first night, fending off the zombies. He lost two villagers, but the rest survived. But there was so much we didn't know. I didn't know yet what a "zombie siege" was, and Nathan, being only eight, didn't understand the nuances of Minecraft mechanics, like mobs only spawning in an active chunk. He only knew that zombies were coming out at night and attacking his villagers, and he felt like he didn't dare leave the village for fear of what would happen to them. The second night disaster struck. The zombies came again, got through the door into the largest building where Nathan was holed up with most of the villagers, and the zombies killed them all. So there Nathan was, in tears, utterly distraught, and taking the loss as deeply personal. He kept saying, "It's all my fault." I didn't know what to tell him, and I certainly didn't know enough about Minecraft at that point to know what, if anything, we might do. I mumbled something consoling to him, and told him we'd fix the village somehow. Mostly I just wanted to get him calmed down. Water World stood idle for a long time after that. I let time pass, and then suggested that maybe we could do something for the village. Maybe we could build a memorial. Nathan liked that idea, and it seemed to provide some closure, so we did. And that's how the name "The Lost Village" came about. My next thought was that we could find another village and somehow transplant some villagers to the Lost Village. We began extensive exploration out from our main base. One interesting find: over the hills past the Lost Village the savannah returns to desert, where we found a sand temple. However, there was no treasure in the temple. The lower levels intersected with a cavern system that was always swarming with zombies. We eventually traced the zombies back to a dungeon with a mob spawner, but at the time it was just too difficult to get at the mob spawner, so we left the whole area alone. 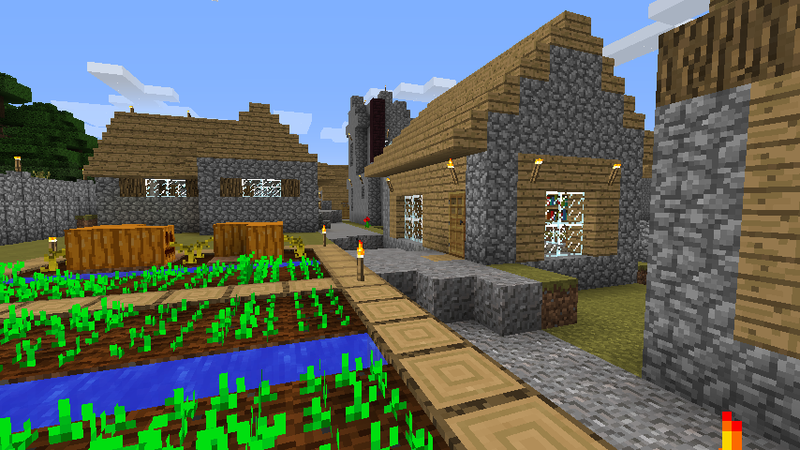 Villages are incredibly rare. Months later Alex did find another small village, but it was more than 5000 blocks away. There was no practical way to do anything with it. Nathan watches a lot of Minecraft videos on YouTube. One day he came up to me and said, "Did you know that there are zombie villagers?" I didn't, but he showed me a video. 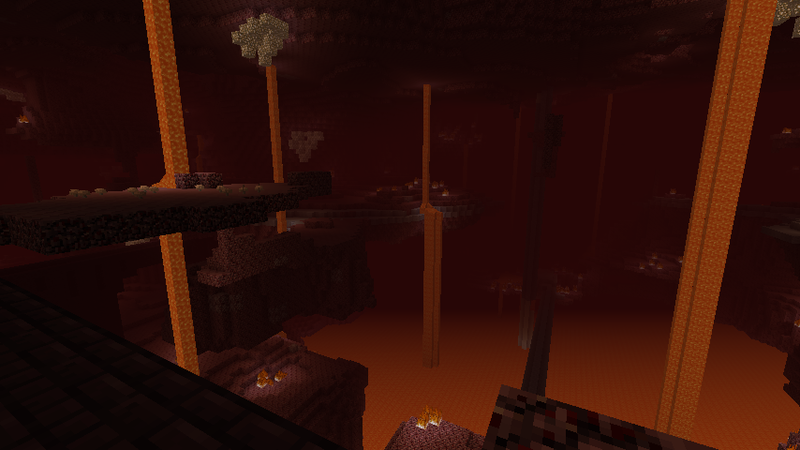 Then Nathan took a keen interest in exploring the Nether, explaining that we had to find blazes. I did some casual reading in the Minecraft wiki, and it seemed obvious that blaze rods and blaze powder would be useful in many ways, so we established a Nether Portal and set off to explore the Nether. Exploring the Nether was a long process. It took us many sessions to make progress. The culmination of our efforts was a long series of cobblestone tubes that I built which connected our Nether Portal to a Nether Fortress. But sure enough, we found blazes, and a blaze spawner, and before long we had blaze rods. The very first thing that Nathan wanted to craft with our blaze rods was a brewing stand. Not long after this I logged in one day to find that Nathan had taken all of the spider eyes we had collected, fermented them, and brewed them into potions of weakness. Mystified, I asked him what he wanted potions of weakness for. He said, "If you weaken a zombie villager, you can cure him. You can heal him back to a villager with a golden apple." He had seen it in a video. I had had no idea, but I looked it up on the wiki, and sure enough Nathan was right. By now about six months had passed since the zombie siege at the Lost Village, but Nathan had not given up hope. All this time he had been researching how to get his villagers back. Now he had a plan, and the tools he needed for that plan. Zombie villagers are still pretty rare. Nathan's plan required that we find a zombie villager in the wild, that we be able to isolate it from other hostile mobs, and that we be able to corner it long enough for the potion of weakness to take effect. I considered it a real long shot that we'd ever be able to pull this off, but it gave Nathan hope. It worked! He turned a zombie villager back into a villager! 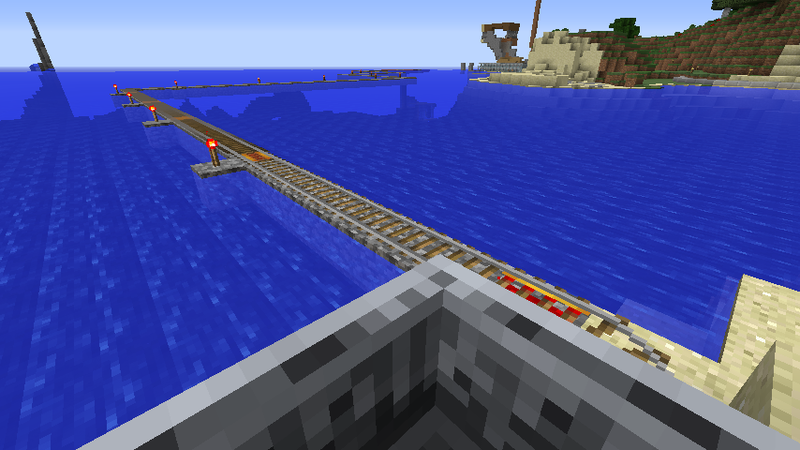 With some nudging and shoving we quickly herded the villager onto a small island nearby. 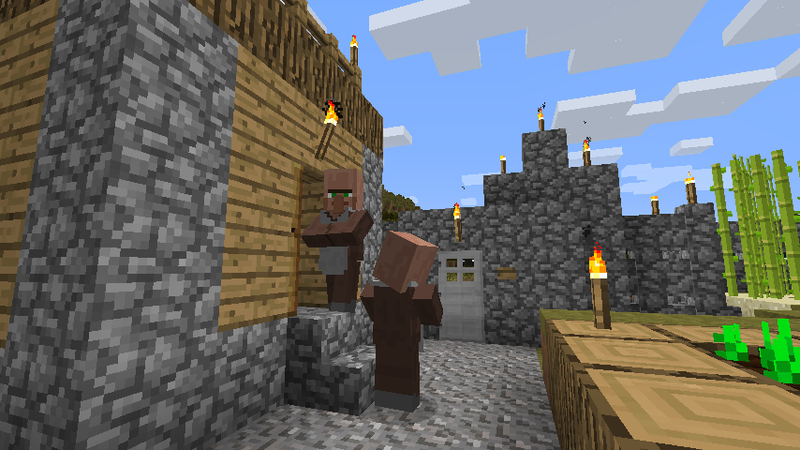 We built a wall around the island, filled the island with torches to keep hostile mobs from spawning there, built a house on the island for the villager, and installed an iron golem as protection. Now we had to figure out how to get the villager to the Lost Village. Then tragedy struck. We're still not sure what happened, but we came up from the base one morning to check on our island, and there was no villager. The iron golem was still there, but nothing else was to be found on the island except a piece of rotten flesh. Our assumption was that somehow a zombie got onto the island and killed the villager before being killed in turn by the iron golem. While Nathan was upset, somehow neither one of us lost hope. Something that had seemed mere fantasy now seemed possible. We were more determined than ever to restore the Lost Village. 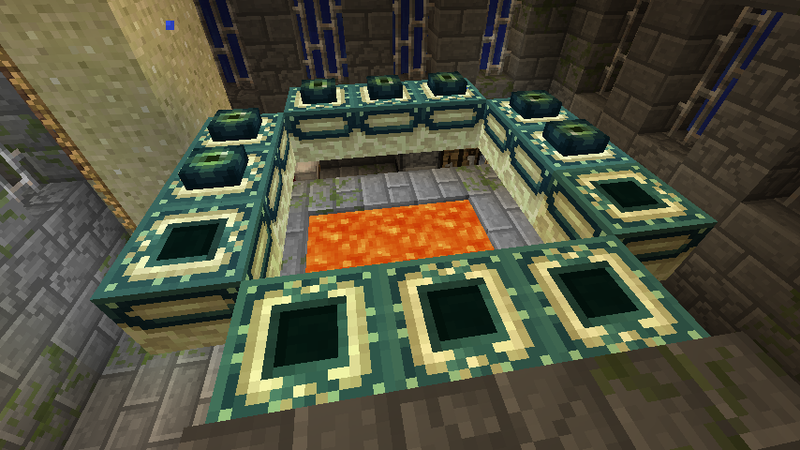 As we talked about what to do next in Water World, the topic of the sand temple and the nearby mob spawner came up. Nathan wanted to build a mob farm out of the spawner, something that would let us gain experience safely and more or less automatically. He said we'd need all the levels possible before facing the Ender Dragon in the End. This made sense, and I did some reading up on how to make a mob farm. Basically we needed to light up the area around the spawner to keep mobs from spawning, then mine out underneath the spawner, fill the mined out area with water, and flow the water down to a capture point where the current would be too strong for the mobs to escape, and we where we also had a small window from which to attack them without facing return attacks. Sounds complicated, but it actually wasn't that bad to build. It only took us a couple of sessions. Somewhere in this construction process I finally thought through the implications of our mob spawner being a zombie spawner. This meant that some small fraction of the zombies spawned would be villager zombies. "Nathan," I said, "I have a plan." First, we prepped the village. This was mostly me because it's a lengthy task, and boring. I put cobblestone walls all the way around the entire village, and then filled every open space and rooftop in the village with torchlight so that no hostile mobs could spawn within the wall. 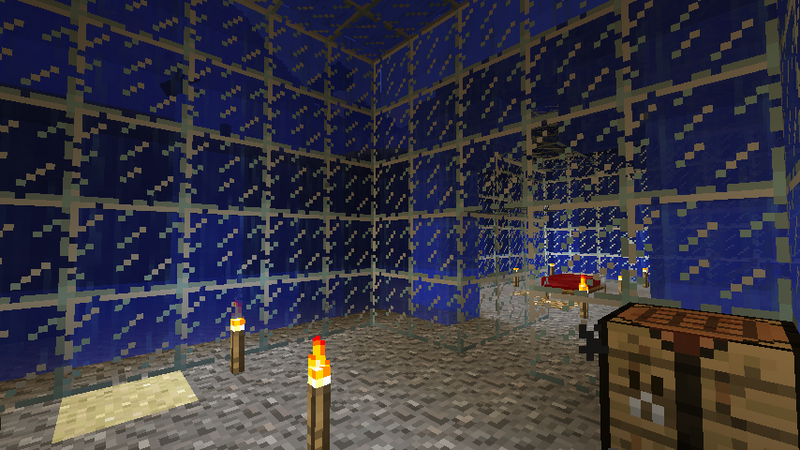 Then I put iron doors in the walls (remember that only players, not mobs, and not villagers, can open iron doors). So now the village was safe, and we had a way to get in and out without jeopardizing the village. 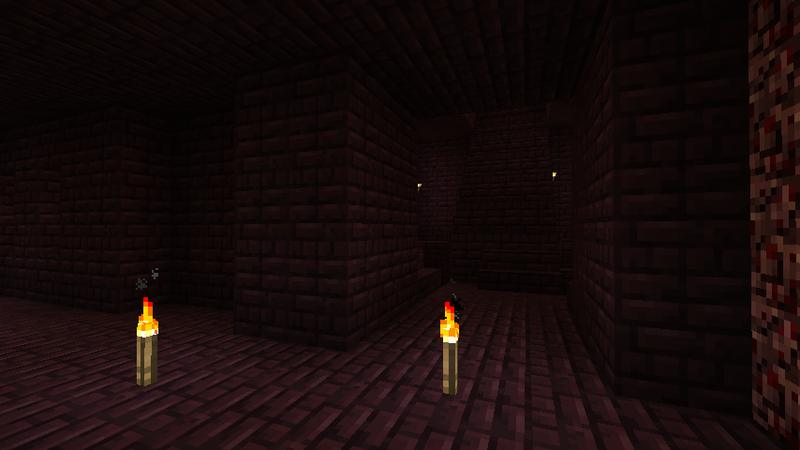 Next I dug a tunnel from the village to the mob farm over by the sand temple. This is a long tunnel, and took quite a while to build. I haven't calculated exactly, but it's about 750 blocks long. Finally I returned to the mob farm. About two blocks back from the capture point I dug out a "chimney" that punched through to a cavern room up above. We were ready. I put four blocks of sand in my inventory, and Nathan put a potion of weakness and golden apple in his inventory. I travelled overland to the mob farm to wait at the top of the chimney. Nathan travelled through the tunnel to wait at the capture point. 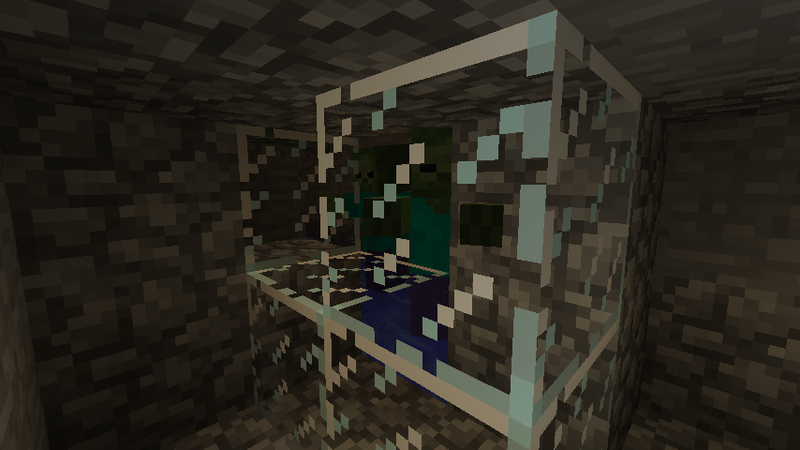 Amazingly the very first zombie to float down to the capture point was a villager zombie. I dropped sand behind it, blocking off the rest of the mob farm and all subsequent spawned zombies, and Nathan hit the village zombie with the potion of weakness and then, a few minutes later, with the golend apple. Just like that we had a villager. Nathan punched down the wall separating our attack point from the capture point, and the villager stepped through. Then Nathan began the long, tedious process of pushing and prodding the villager all the way through the tunnel to the village so many blocks away. At the very end, I guess when the villager got within "range" of the Lost Village, because he sprinted all the way to the end of the tunnel, waiting eagerly for Nathan to open the iron door and release him into his new home. We then returned to the mob farm and repeated this process. This time Nathan had to clobber quite a few regular zombies before a zombie villager showed up, but eventually one did. The same conversion process worked, and the same long trudge back through the tunnel returned a second village to the Lost Village. And so, a year later, we've done it. Two villagers can make more villagers, or we can convert more zombie villagers, or a combination. Regardless, the Lost Village has been restored and can flourish once again, now fully protected from the threat of zombie sieges. All this has been accomplished thanks to the determination, irrepressible hope, and hard work of one little boy. Had it simply been left up to me, it never would have happened. Is your child capable of long term, complex project work? Can your child research on their own the steps to complete a long term project? Does your child have the patience to complete a project where the gratification of completion may be far away? Does your child have the resilience to encounter the setbacks that are inevitable in a complex project, and to both accept that setbacks happen and to persevere to overcome them? Do those kinds of project skills sound like that would be valuable later in life? Perhaps in college, or in professional life? Minecraft has given Nathan skills, and maturity, and confidence that I don't know how my wife and I would otherwise have taught him at this age. He's nine, so the degree to which these lessons carry over to the rest of his life is still limited. But the foundation is there, something we can build on and refer to as he confronts life's other challenges. For that I am deeply grateful. 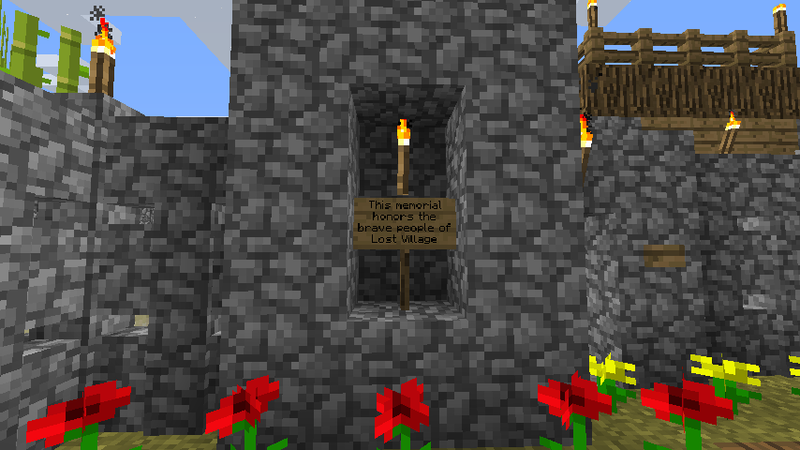 For that I will always honor the Lost Village.